It would be hard to top the performance put on by the Philadelphia Phillies on Opening Day. And yet, incredibly, there still remains room for improvement with this team as they prepare to welcome fans back to South Philly for game two of 162 on Saturday afternoon. The Phillies (1-0) crushed the defending National League Eastern Division champion Atlanta Braves (0-1) by a 10-4 score on Thursday afternoon. The sellout crowd of 44,469 watched their heroes power their way to victory by driving three home runs, one each from Andrew McCutchen (in his first official Phillies plate appearance), Maikel Franco and Rhys Hoskins. Those 10 runs marked the most scored by the club on Opening Day since the 2014 team out-slugged the Texas Rangers by 14-10 at Globe Life Park in Arlington. The Phillies had never treated a home opener crowd at Citizens Bank Park to a double-digit display such as that in the prior 15-year history of the ballpark. To find the last Phillies double-digit scoring spree in a home opener you would have to go all the way back to April 12, 1991 at Veteran’s Stadium when Lenny Dykstra, Darren Daulton and John Kruk powered the Phillies to an 11-4 victory over the Saint Louis Cardinals. On that Friday night they knocked the Cards lefty starter out after two innings, touching him for five runs and seven hits. That pitcher’s name? Jamie Moyer. So, how can the Phillies improve on that performance? For one, despite the power display they only managed seven total hits, taking advantage of six walks from the Braves hurlers. Newcomers Bryce Harper and J.T. Realmuto each went hitless at 0-3 in their debut with the team. On the mound, while Aaron Nola was dominant at times he also walked five batters himself. He was followed to the mound by Hector Neris and David Robertson, who each threw an inning and combined to allow three earned runs on four hits and a walk while striking out no one. The Phillies will face a rookie hurler making just his second big-league start on Saturday. No matter the makeup of any particular year’s club, the team has historically struggled against such arms. It would be great to see them pick him apart this afternoon. On the mound for the Phillies will be Nick Pivetta, the darling of sabermetricians and one of this year’s popular breakout player picks by national media. Consistent solid outings from the 26-year-old right-hander will be just as important to the success of this year’s team as the new, high-powered offense. Over the course of a 162-game regular season schedule there are going to be plenty of good days and bad days. The very best teams in baseball are going to lose around 60 games or so. You won’t always be at your best, and even when you are there is another team on the field trying to win as well, one that might be playing well itself. This is a far deeper and more talented ball club than took the field last season. As we prepare for the second game of a long season it remains important for fans not to get too high or too low with every single game, streak or slump. But the excitement surrounding this Philadelphia Phillies ball club is wholly warranted. In 29 career games on the Citizens Bank Park mound, Pivetta has a .249 batting average against. The righty has surrendered 143 hits over 151.1 innings with a 184/43 K:BB ratio. He has also been touched for 28 home runs. Wilson was a fourth round pick by the Braves in the 2016 MLB Amateur Draft. The right-hander will be making just his fourth big-league appearance, his second start. Won his only other starting assignment last August 20 at Pittsburgh, going five shutout innings allowing three hits with five strikeouts and three walks. Became youngest pitcher to ever win a 1-0 game in their big-league debut. Currently Atlanta’s #7 ranked prospect. Harper has slashed .276/.393/.515 over 113 career games vs Atlanta. His 25 homers against the Braves are his most vs any MLB opponent. Nick Markakis has slashed .294/.400/.471 vs Pivetta and is the only Braves current batter to hit a home run off him. Following Sunday afternoon’s game the Phillies have an off-day on Monday before heading to Washington for the Nationals home opener on Tuesday. A quick two-game set will mark Harper’s first trip back to D.C., where he played his first seven seasons. Should make for an, uh, interesting couple of games. Club then returns for a six-game homestandwhich wraps with another three vs Washington. 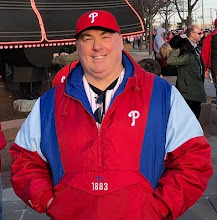 Originally published at Phillies Nation as "Phillies - Braves 3/30 preview and notes"